one of our co-workers grows rhubarb like crazy at her house. since she doesn't know what to do with all of it, she often gives us some to take home. we are grateful since you can't beat homegrown rhubarb! we have put our co-worker's rhubarb to good use in lots of things like strawberry rhubarb crumble and rhubarb macaroon pie. 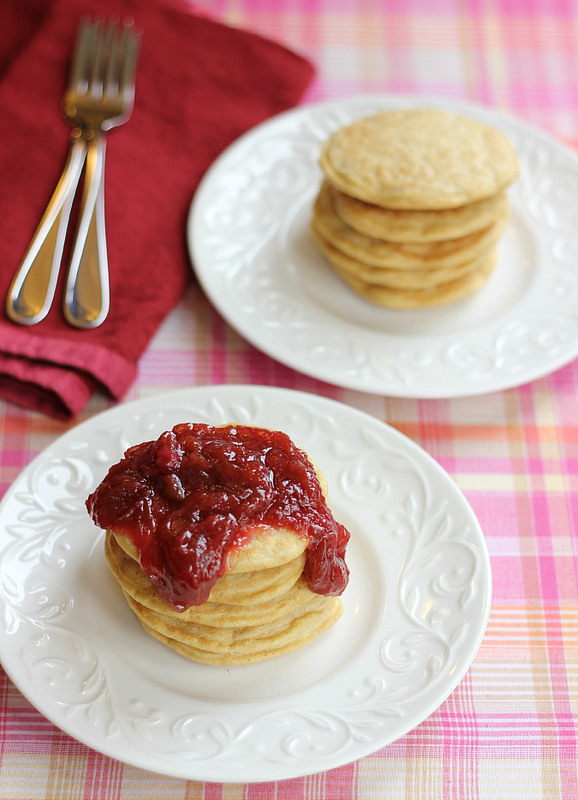 over the weekend, we made a rhubarb sauce to put on top of pancakes. the tart rhubarb becomes sweet and delicious in this sauce. 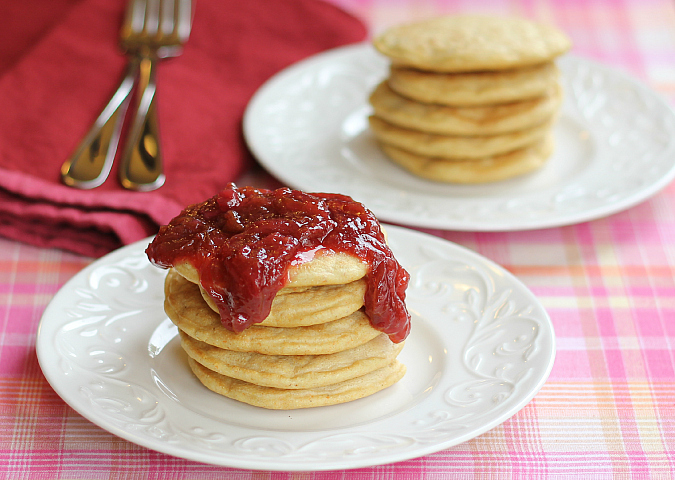 it is perfect over any pancakes or waffles, or even spread on a slice of toast. it went really well with our cornmeal pancakes. such a great combination! to make the pancakes, in a large bowl whisk together the flour, cornmeal, baking powder, and baking soda. whisk in the buttermilk, vanilla, and eggs. stir in the melted butter. heat a lightly buttered griddle or frying pan on medium heat. pour 1/4 cup of batter onto the griddle for each pancake. cook for 3 minutes until small bubbles begin to form. flip the pancakes when they start to bubble, then cook for 3 minutes, until they are golden brown and cooked throughout. serve warm topped with rhubarb sauce. to make the sauce, combine the rhubarb and sugar in a saucepan over medium heat. bring to a simmer and cook until tender. cook, stirring occasionally, until thickened (about 5-7 minutes). *note: this recipe will make extra rhubarb sauce. I've never had cornmeal pancakes! I'll have to try them!